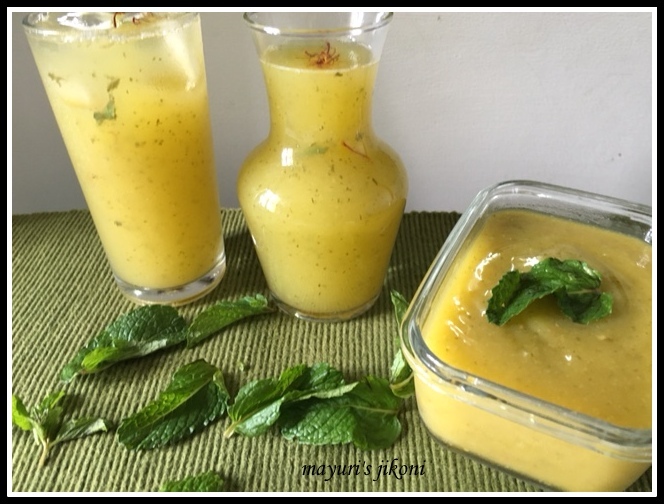 Mango panna, aam panna or raw mango juice is a cool, refreshing drink made during the summer in India. It prevents heat exhaustion as its loaded with sugar and is rich in pectin, Vitamin B and C. Most aam panna recipes will recommend boiling the mangoes with the peel but nowadays we just can’t be sure what chemicals may be present on it. I prefer peeling the mango before boiling it and I like using the half raw mangoes so that I don’t have to load it with sugar to make it palatable. In India I use the semi ripe alfonso mangoes and in Kenya it has to be the apple mango. If these are not in season as yet, then use the tiny mangoes that are usually available for chutneys. The semi ripe ones will be yellow inside. Put the water, mango and ginger in a pan. Cover it with a lid and boil over medium heat till the mangoes become soft. Put the mixture in a blender jug. Strain the mixture using a sieve. Return a bit of the puree to the blender. Add mint leaves and process. Add it to the other puree. Add salt, sugar and cumin powder. Stir to mix well. Divide the pulp into 6-8 serving glasses. Top each glass with a cup of the ice cold water. Stir well. Peel the mangoes and cut it into chunks. Add 1 cup water and cook the mangoes till done. Liquidise the cooked mango along with the jaggery. Strain the puree through a wire mesh sieve. Return the puree into the blender. Add the mint leaves. Process till mint leaves are crushed. Pour the puree into a glass jar or a container of your choice. Add cumin seeds, saffron strands and cardamom powder. To prepare the drink, add 3-4 tbsp of the mango puree into a glass. Add cold water and ice cubes. Stir and serve. Taste the mango before adding the sugaror jaggery. If it is not too sour then you may require less sugar. If you want to use an artificial sweetener instead of sugar then you require 2 tsps of it for each glass. Add honey instead of sugar. Instead of ginger and mint use ¼ tsp saffron powder and 1 tsp cardamom powder. Use fresh basil leaves instead of mint. You can freeze the pulp and serve mango panna even when its not mango season. I have written that it serves 6-8. I prefer to add 3 tbsp of the pulp. Some prefer to add less. I store the pulp without adding sugar. That way I can add sweeteners, sugar, gur or honey as guests or family prefer.